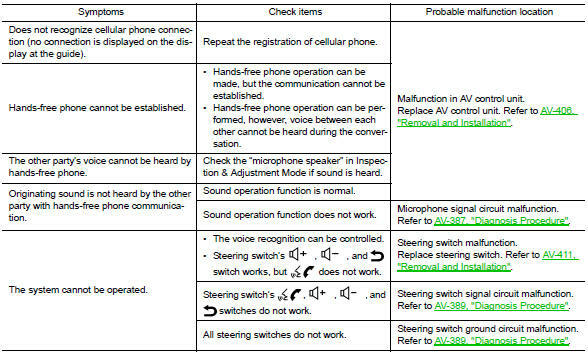 Before performing diagnosis, confirm that the cellular phone being used by the customer is compatible with the vehicle. It is possible that a malfunction is occurring due to a version change of the phone even though the phone is a compatible type. This can be confirmed by changing the cellular phone to another compatible type, and check that it operates normally. It is important to determine whether the cause of the malfunction is the vehicle or the cellular phone. Make sure the customerвЂ™s bluetoothВ® related concern is understood. The customerвЂ™s phone may be required, depending upon their concern. Write down the customerвЂ™s phone brand, model and service provider. It is necessary to know the service provider. On occasion, a given phone may be on the approved list with one provider, but may not be on the approved list with other providers. Using the websiteвЂ™s search engine, find out if the customerвЂ™s phone is on the approved list. 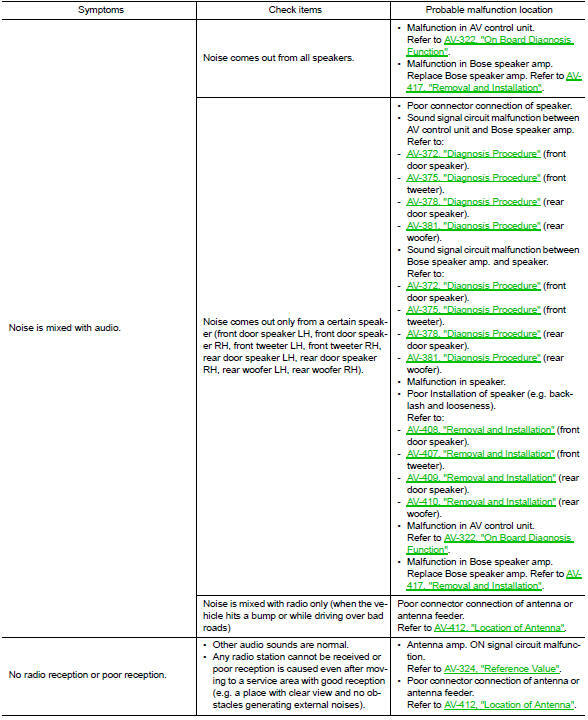 If the customerвЂ™s phone is NOT on the approved list: Stop diagnosis here. The customer needs to obtain a BluetoothВ® phone that is on the approved list before any further action. If the feature related to the customerвЂ™s concern shows as вЂњNвЂќ (not compatible): Stop diagnosis here. If the customer still wants the feature to function, they will need to get an approved phone showing the feature as вЂњYвЂќ (compatible) in the вЂњBasic FeaturesвЂќ. If the feature related to the customerвЂ™s concern shows as вЂњyвЂќ (compatible): perform diagnosis as per the following table. 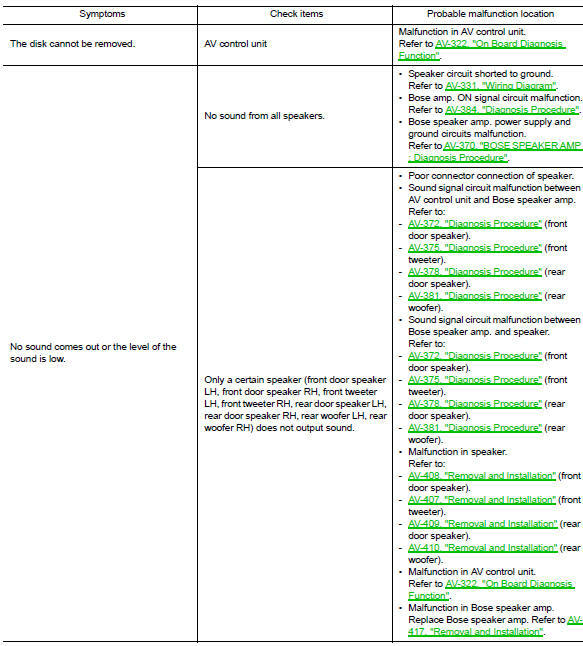 The majority of the audio concerns are the result of outside causes (bad cd, electromagnetic interference, etc.). The following noise results from variations in field strength, such as fading noise and multi-path noise, or external noise from trains and other sources. It is not a malfunction. Fading noise: this noise occurs because of variations in the field strength in a narrow range due to mountains or buildings blocking the signal. Multi-path noise: This noise results from the waves sent directly from the broadcast station arriving at the antenna at a different time from the waves which reflect off mountains or buildings. The vehicle itself can be a source of noise if noise prevention parts or electrical equipment is malfunctioning. 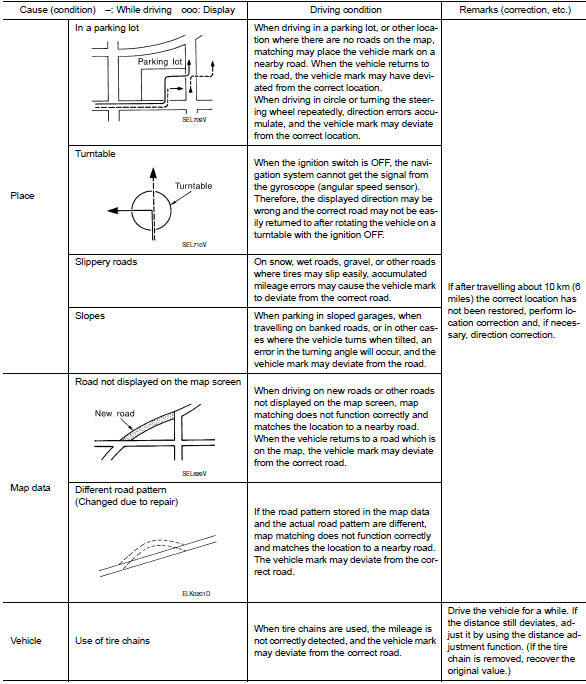 Check if noise is caused and/or changed by engine speed, ignition switch turned to each position, and operation of each piece of electrical equipment, and determine the cause. The source of the noise can be found easily by listening to the noise while removing the fuses of electrical components, one by one. Vehicle's travel amount is calculated by reading its travel distance and turning angle. 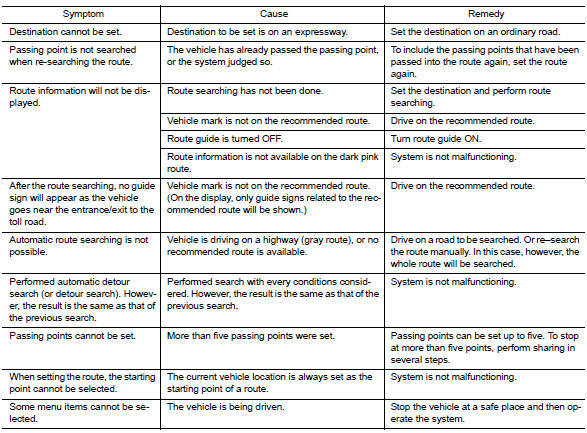 Therefore, if the vehicle is driven in the following manner, an error will occur in the vehicle's current location display. If correct location has not been restored after driving the vehicle for a while, perform location correction. The map-matching function needs to refer to the data of the surrounding area. It is necessary to drive some distance for the function to work. 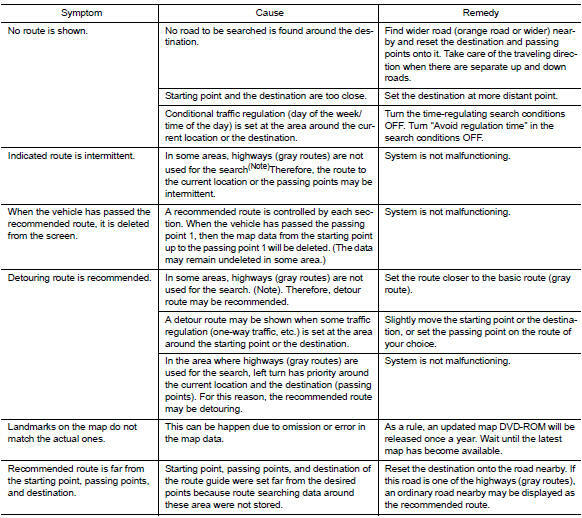 Because map-matching operates on this principle, when there are many roads running in similar directions in the surrounding area, no matching determination may be made. The location may not be corrected until some special feature is found. The current road name may not be displayed if there are no road names displayed on the map screen. Difference of the BIRDVIEWв„ў screen from the flat map screen are as follows. The current place name displays names which are primarily in the direction of vehicle travel. The amount of time before the vehicle travel or turn angle is updated on the screen is longer than for the (flat) map display. The conditions for display of place names, roads, and other data are different for nearby areas and for more distant areas. Some thinning of the character data is done to prevent the display becoming too complex. In some cases and in some locations, the display contents may differ. 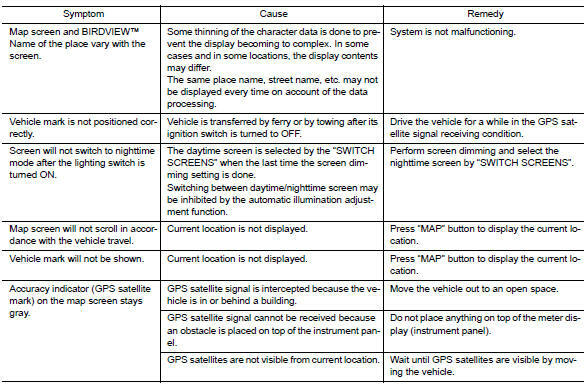 In the following cases, the vehicle mark may appear on completely different position in the map depending on the gps satellite signal receiving conditions. In this case, perform location correction and direction correction. If the receiving conditions of the gps satellite signal is poor, if the vehicle mark becomes out of place, it may move to a completely different location and not come back if location correction is not done. The position will be corrected if the gps signal can be received. Because calculation of the current location cannot be done when traveling with the ignition off, for example when traveling by ferry or when being towed, the location before travel is displayed. If the precise location can be detected with GPS, the location will be corrected. If the current location and the vehicle mark are different when map matching is done, the vehicle mark may seem to jump. At this time, the location may be вЂњcorrectedвЂќ to the wrong road or to a location which is not on a road. If the current location and the vehicle mark are different when the location is corrected using gps measurements, the vehicle mark may seem to jump. At this time, the location may be вЂњcorrectedвЂќ to a location which is not on a road. The navigation system moves the vehicle mark with no distinction between land and rivers or sea. If the vehicle mark is somehow out of place, it may appear that the vehicle is driving in a river or the sea. The system wrongly memorizes the rotating status as stopping when the ignition switch is turned ON with the turntable rotating. That causes the vehicle mark to rotate when the vehicle is stopped. The conditions of the gps antenna (gps data) and gyroscope (angular speed sensor) change gradually. 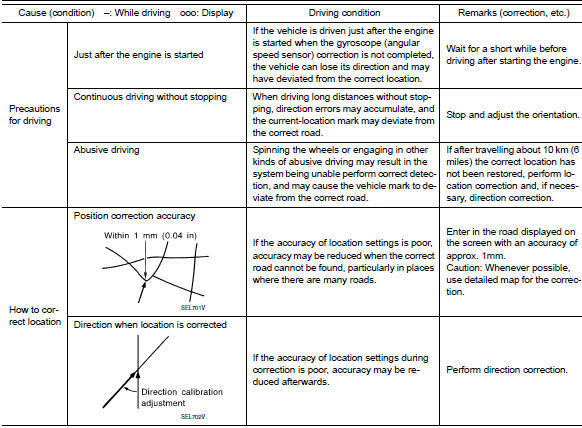 Depending on the road traveled and the operation of the steering wheel, the location detection results will be different. 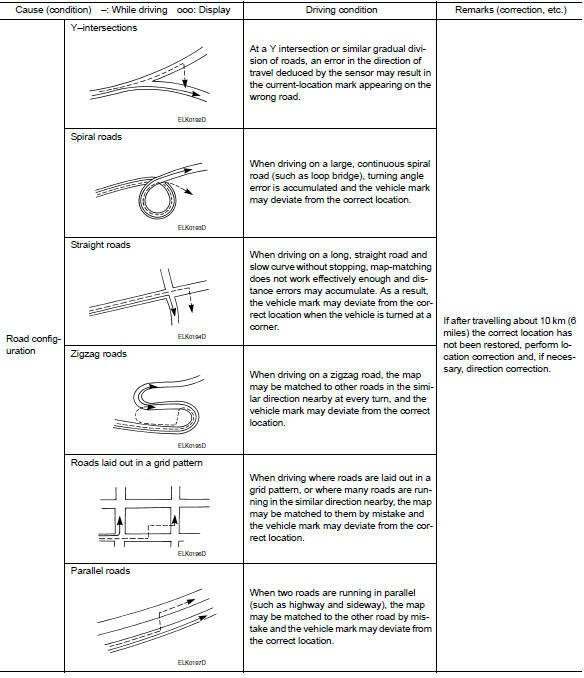 Therefore, even on a road on which the location has never been wrong, conditions may cause the vehicle mark to deviate.